SDM 504: the perfect combination of recycling and cash in functionality. 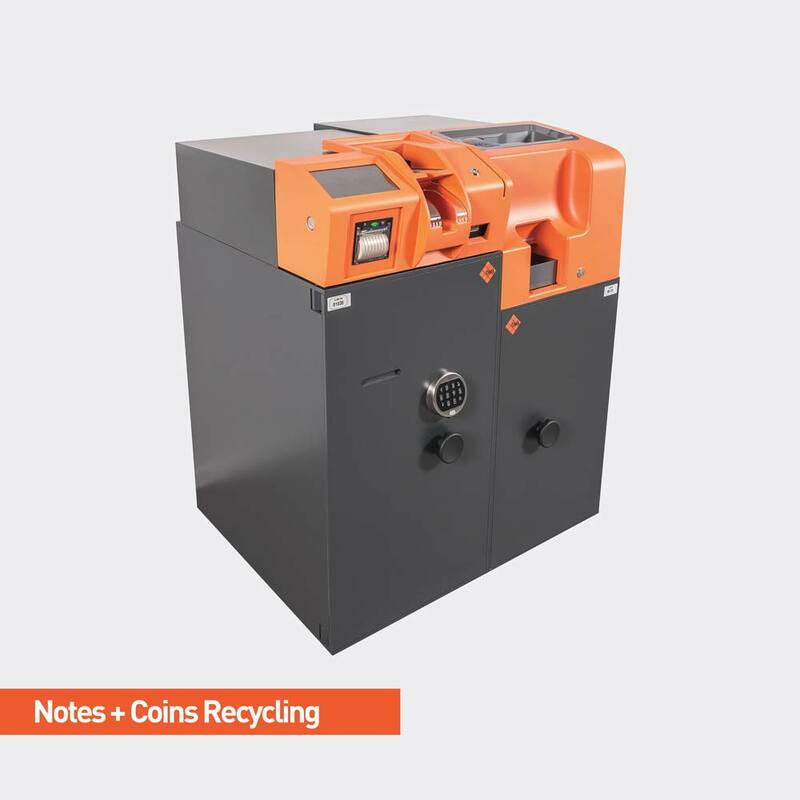 A unique device for the retail with four recycling drums having a capacity up to 500 notes each, and with an innovative stacking bag for storing and collecting the money. 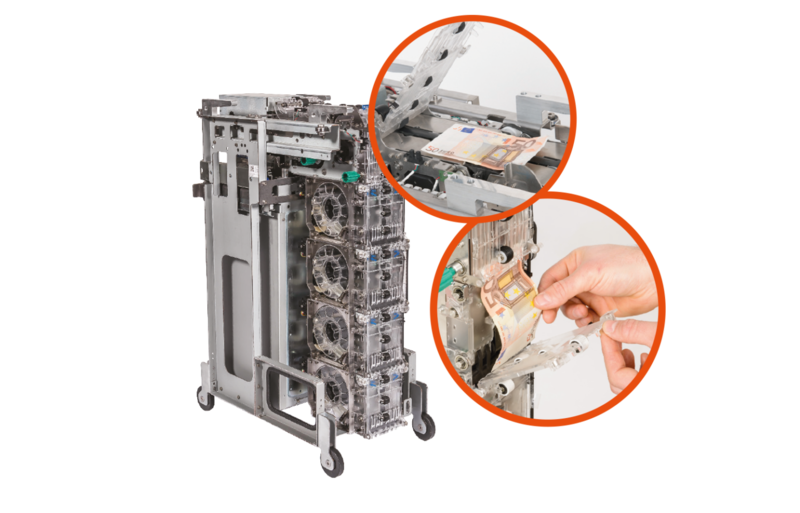 SDM 504, in addition to the deposit function, handles up to 5.000 banknotes, 2.000 of which in recycling, while still keeping the ease of use and a compact size of only 0,32 sq.m. footprint. 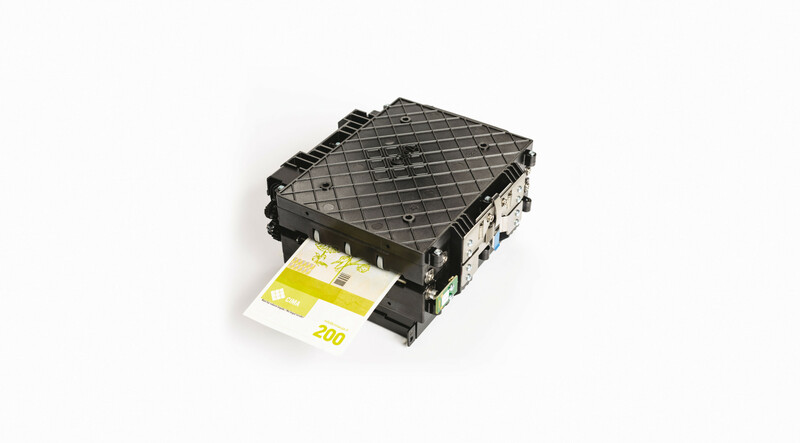 The upper plate is made up of an input slot that contains up to 200 banknotes at a time and an exit slot with a capacity up to 30 banknotes, of a plastic top hood, customizable in colour, of the authenticity validator BV5000, manufactured by CIMA in compliance with the regulations of the main Central Banks (Euro currency included). 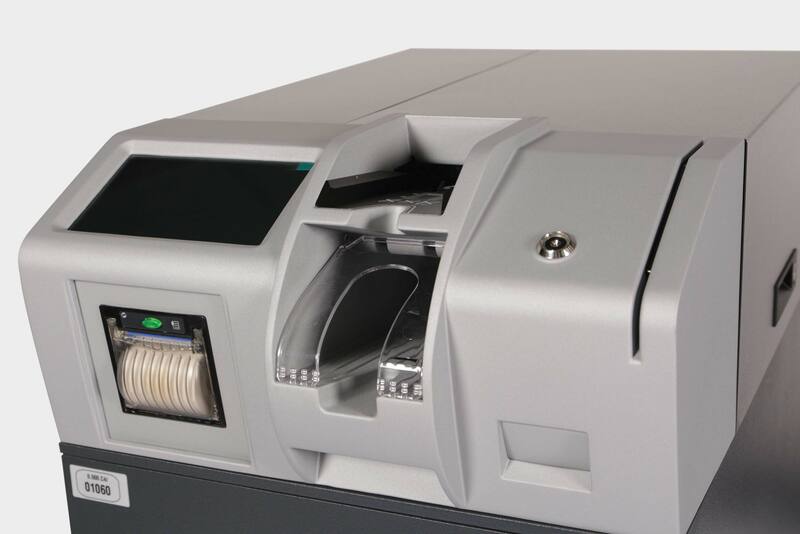 SDM 504 is perfect to handle medium cash volumes, vouchers or cheques scanning, with an input speed of 6 banknotes/sec. The combination between cash-in and cash-out functionalities allows medium and small-size retailers to prepare the cashier start-of-the-day float in the morning and to make the deposit at the end of the day. 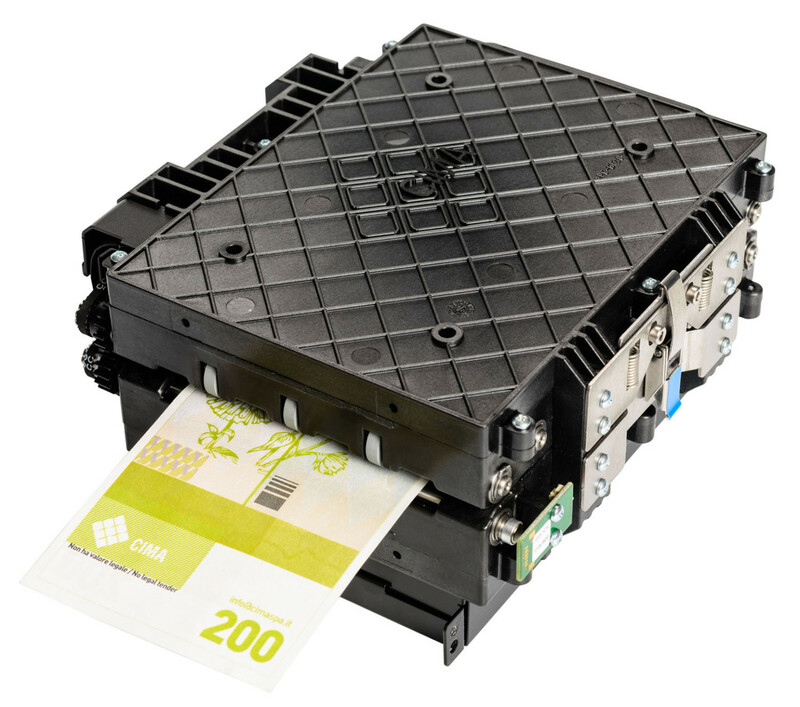 The device can be integrated with coin handling devices: a complete service to exchange money, to give the change in notes or coins. 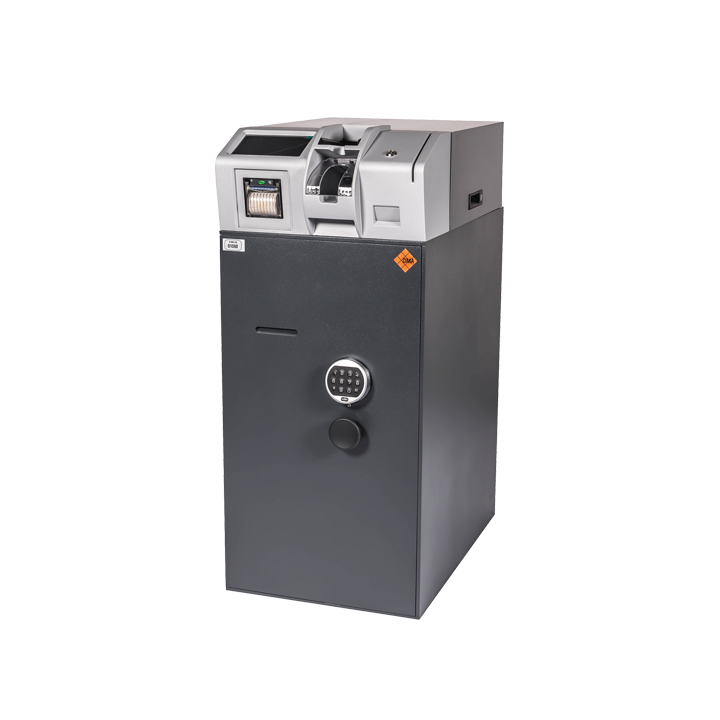 A user-friendly interface allows the operator to identify himself through Dallas key, pin code or card reader and to follow his own deposit on the touch screen, and then print the receipt. 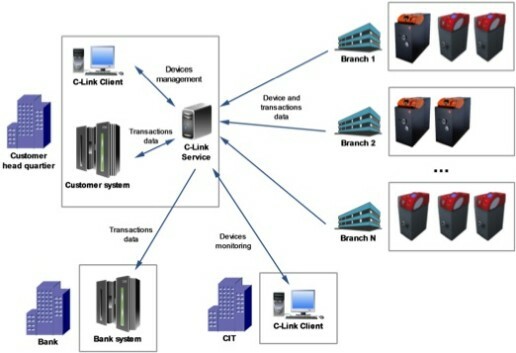 The device operating software, when integrated with the customer’s IT system, allows to completely align the equipment’s data with the platform in use, giving information both about the amount of notes processed and each individual user’s accounts. The device is available with two different storage solutions: the high capacity canvas bag containing up to 3.000 notes free fall, locked by a cover with manual seal, and the disposable stacking heat-sealing bag containing up to 3.000 notes. 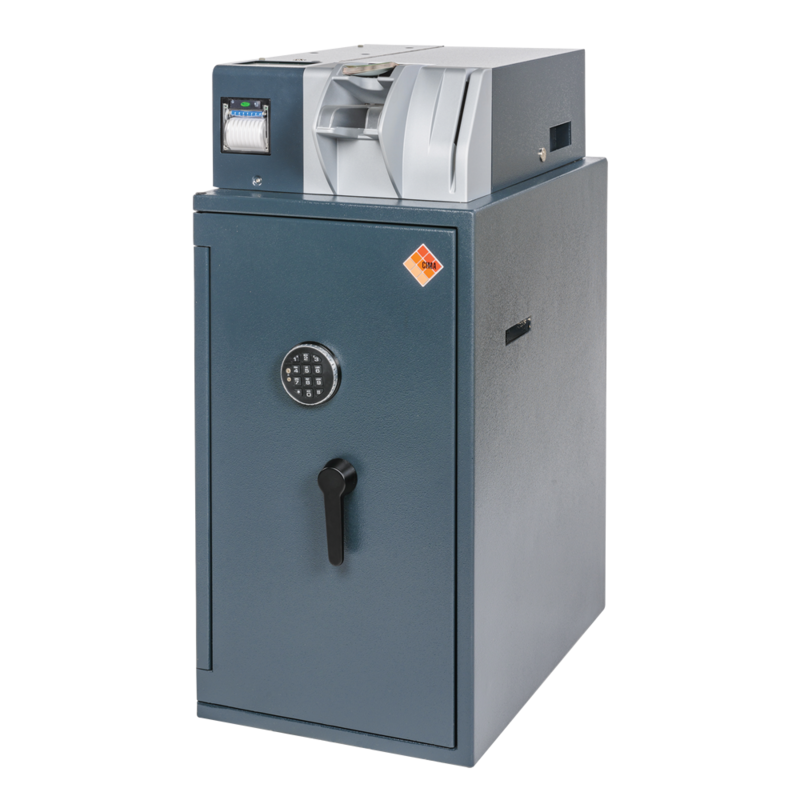 In the stacking bag version the safe’s opening is allowed just once it has completely sealed, thereby allowing the money collection by one individual operator, and no longer two according to the usual procedure, which results in a remarkable cost saving. Unlike the free fall solution, notes are stacked in this bag, which further contributes to reducing the money processing costs at the cash center. 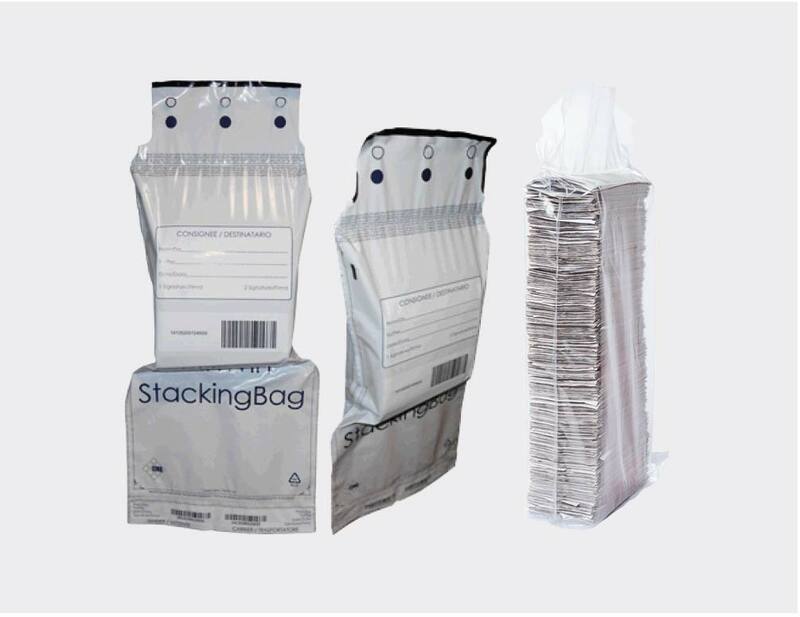 THE NOTES STORAGE IN DISPOSABLE STACKING BAGS IS THE MOST COMPETITIVE AND FUNCTIONAL SOLUTION CURRENTLY AVAILABLE ON THE MARKET. • insert stacking bags in transport boxes equipped with ink dye systems by the major manufacturers. • New generation electronics based on high speed microprocessors and CAN BUS communication. • Transport technology featuring completely see-through materials, allowing the total notes’ visibility inside the areas involved. • Magnetically locked doors to immediately access the areas involved by note jams. 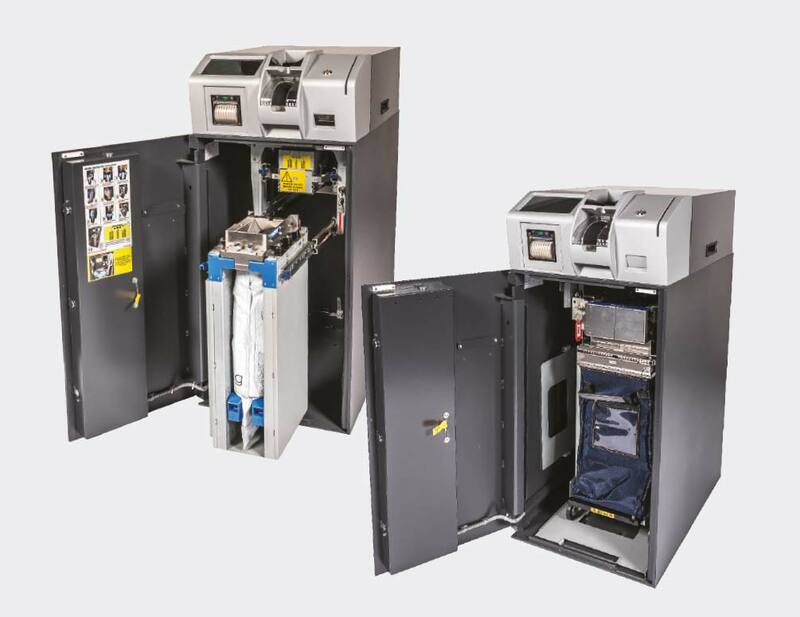 • New frame totally released from the device by means of self-centering steel connection systems with pivoting wheels, allowing to completely remove the frame for cleaning or maintenance purposes, or to be replaced upon reaching certain amounts of notes processed. • possibility to prepare a start-of-the-day float to set up the cashiers’ daily operations. 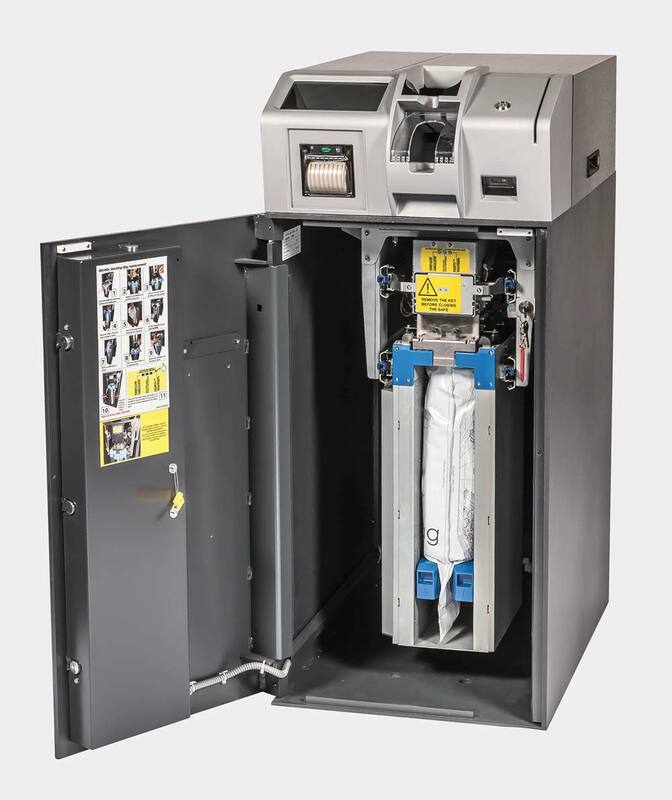 Variable bag capacity depending on: safe type, quality of the banknotes, right opening of the bag and bag model. 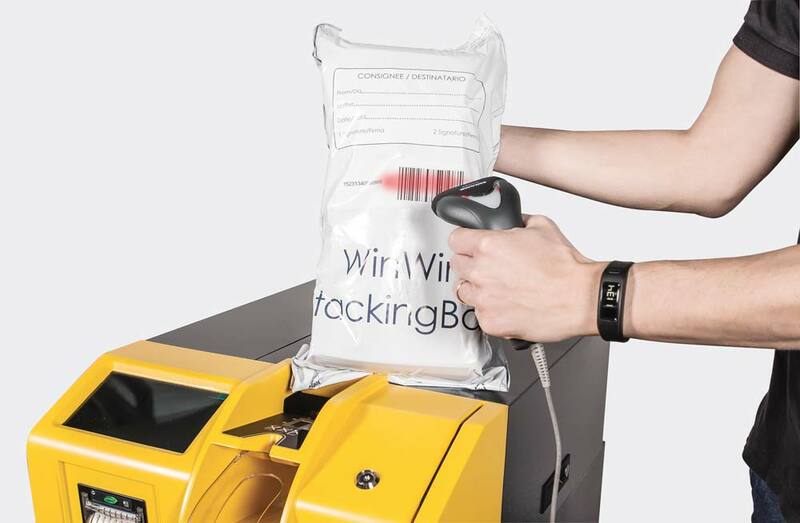 disposable stacking heat-sealing bag containing up to 3.000 notes. 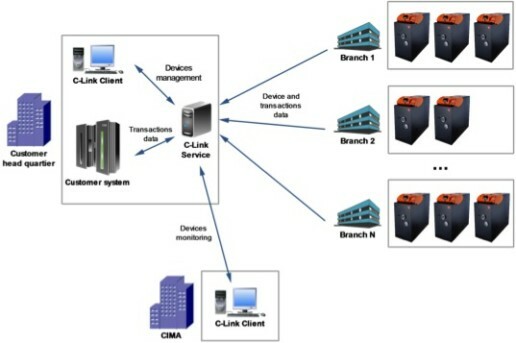 C-LINK IS THE INNOVATIVE SOFTWARE PLATFORM FOR THE REMOTE MANAGEMENT OF THE CASH HANDLING DEVICES. • Remote distribution of the firmware updates as well as the recognition sensor: this allows to have a fleet of machines always updated in a short time, without requiring any interventions in the field. 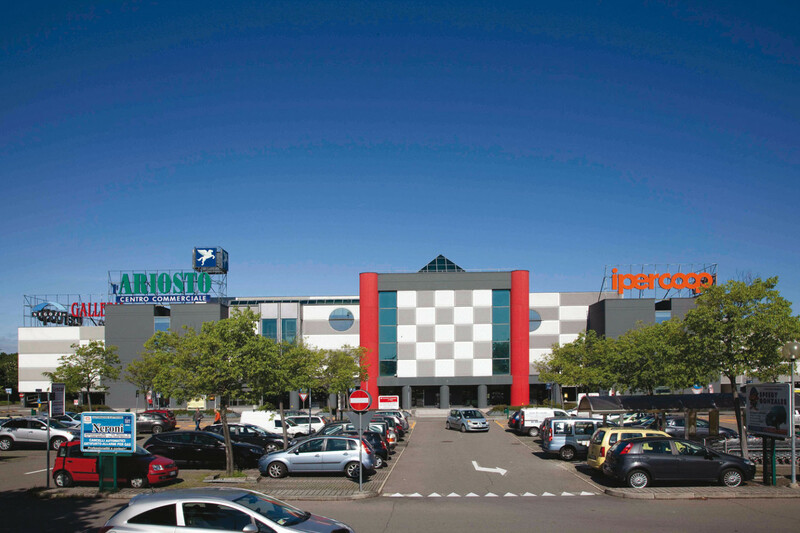 • Remote monitoring of the status of the devices in real time: this enables to identify possible problems from a remote post, allowing an improvement of the quality of the help-desk service with more certain and detailed information. • Remote monitoring of the contents of the devices and of the cash handling in real time: this allows to have always a global vision of the level of use of one’s own devices through suitable reports and statistics. 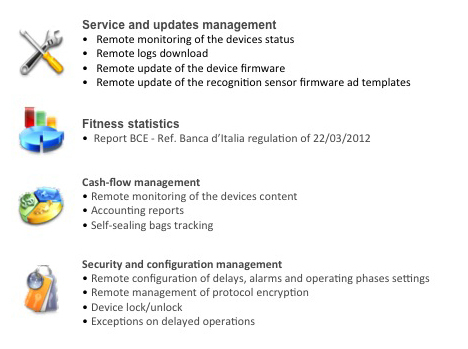 • Remote management of the configuration of the devices: any configuration can be carried out from remote post with no need of on-site interventions. • Production of the statistics about the handling of unfit banknotes according to the Central Bank current regulation. BV 5000 is an authenticity and fitness detector. It was born in 2011 and is fruit of CIMA R&D team. It complies with the regulations of the main Central Banks Euro currency included); the templates have been developed for many non-European currencies, as well as for tickets, vouchers and cheques. BV5000 is a full-image sensor, which combines the most advanced technologies on the market: magnetic, infrared, fluorescence, ultraviolet, visible light.